The deadly fires come in the night, with the swoosh of the wind. Fingers of fire, almost liquid, reaching forward just above the ground; fireballs of mistletoe sailing high in the sky; sparks flying everywhere between. Entropy unleashed. Potential energy gone wild. Or…simply the dragon’s breath. Who are we to comprehend this, let alone prevent it? A hunter’s cigarette, bad hot tub wiring, a windblown tree crashing through power lines. Errors of humans, acts of God, does it matter? The same errors or acts, absent the blow torch wind, have no issue. That wind, and the issue have visited before. Credit Mike Hargreaves. Only details changed since 1964. 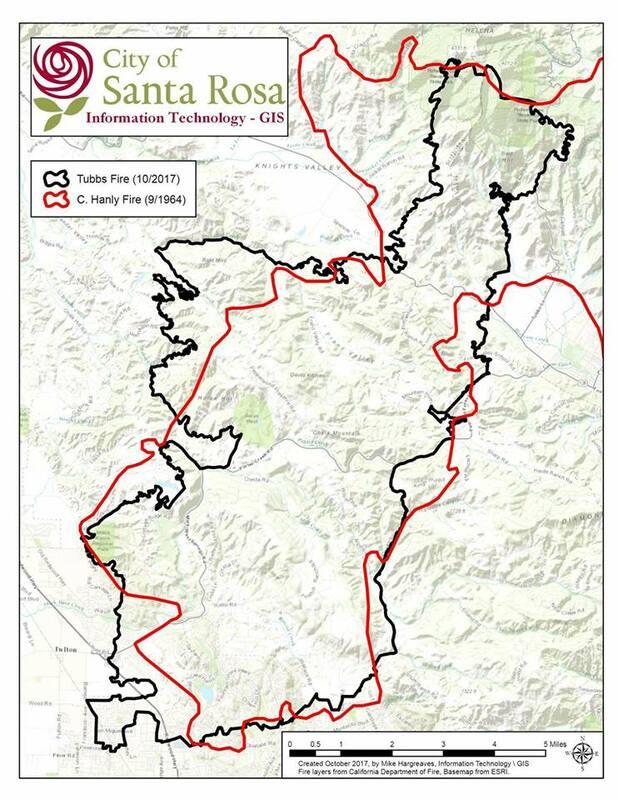 Ignition near Calistoga in Napa County, transit across the Mayacamas Mountains to Santa Rosa…if a wild assed fire chief had not stolen a bulldozer and cut broad fire breaks through what would have been houses this year, the hospital would have burned in 1964. He was lucky. The blow torch wind stopped. By 3:AM fire trucks from Berkeley and San Francisco arrived to slow the fire’s progress at the bottom of the map…and the blow torch wind slowed. Almost on cue. Fifty-three years is over half a human lifetime, a very long time for modern cultural memory to hold. We built plywood houses in the dragon’s breath.